Now this is my kind of recipe! You can make it in half an hour but you talk about it for a week! Heck I have been wanting to make these again since I ate the first one! That is how good they are! I did not so much have the idea as shop-hazardly stumbled upon it. We were at the Grocery store picking up some King Salmon and they happen to have these beautiful huge prawns for sale. I told them to give me 12 of them and I would figure out something to do with them. 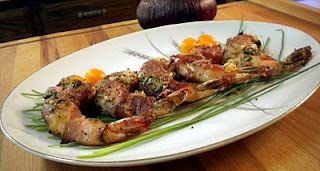 I had wanted to make some prosciutto wrapped prawns last summer but never got around to it, so I figured I would pick up some prosciutto while were were there. They had all kinds of delicious looking prosciutto so I bought the one that Zo thought looked tastiest. I tossed together a rub at the last minute instead of going with only salting and peppering them and magic in our mouths was born! This has to be in my top five favorite recipes of the year! ENJOY, I know you are going to! Whisk all ingredients together in a small bowl and chill until ready to use. Rub 1/2 of rub onto the prawns coating well, cover and let sit in refrigerator for 20-30 minutes. 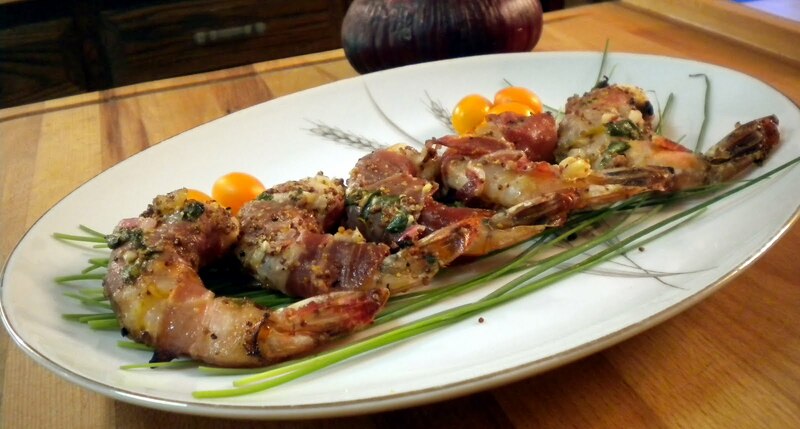 Remove prawns from refrigerator and wrap each one with half of a slice of prosciutto, rub the remaining 1/2 of rub on to the prosciutto wrapped prawns and thread onto the wooden skewers. Lay skewers on the bottom rack and grill for 3-4 minutes, flip and continue to grill 3-4 minutes or until the prawns center has turned opaque. Remove from grill and let cool for 1-2 minutes before serving! Enjoy! Nice post! this looks delicious ,i like it ...Thank you for sharing it. Thanks for reading it and I hope you try it out! I'm going to try these this week! They look awesome. They were really great! I will have to have you guys over for a new prawn and scallop idea I had!